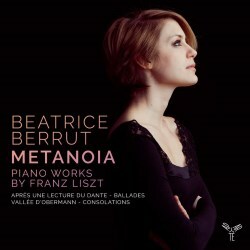 Here we have the young French pianist Beatrice Berrut playing assorted works by Liszt under the title of Metanoia which apparently comes from a Greek word meaning a mental transformation. The programme notes show a progression from darkness into light with depictions of a whole series of emotions throughout the disc. Anyway, she begins the recording with the well-known final piece from the second Années de Pélerinage – the so called Dante Sonata and its dark and sinister depictions of Dante’s visitation to the underworld. From the outset, it is obvious that she is a powerful pianist with a clear idea of where the music is going. The opening is not hurried and is suitably sinister, a quality which helps in this work. She has a refreshing approach to the piece, it’s not hackneyed or flamboyant just for the sake of it, there are some moments of truly wonderful playing – the section leading up to the ‘Presto agitato assai’ is beautifully voiced with some very delicate use of the quiet pedal. This works well as it is exactly what Liszt asks for in the score. She is also perfectly capable of blasting away when required, the interlocked octaves are extremely well played and there is no smudging due to over pedalling. The central more quiet section in F# major is very nicely played and leads well into the interconnecting passage before the part marked Piu tosto ritenuto e rubato, quasi improvisato which I think is one of the most difficult parts of the work and the bit where pianists tend to show what they are made of. There is an otherworldly quality to her playing here and there is not a note out of place. Things do not stay quiet for long as the D minor demonic music soon returns along with myriad difficulties – all of which are coped with admirably by Miss Berrut. The Andante section in D major is also very serenely played and leads nicely into the dramatic statement of the main theme heard at the outset only in D major, rather than D minor. The last few pages are stunningly well played and the ending is suitably powerful. One comment on this recording, it is slightly longer than most I have heard but the whole thing is so well paced that it holds together very well and works perfectly. Miss Berrut follows this with the two Ballades, the first of which I personally think is an underrated masterpiece and deserves to be heard much more often. This is a cheerful and happy piece which includes as its second theme music which Liszt was clearly very fond of as he published it in various different versions in different keys and usually called Klavierstucke! This leads into the music which must account for the subtitle of “Le Chant Du Croisé” – translated variously as “Crusader’s Chant” or March. Here she exhibits a light touch which means that the main theme in the right hand is not overpowered and the whole thing bounces along wonderfully. Toward the end of the piece, the initial music returns before wrapping it all up in a flurry of the march like music but in D flat major rather than A major. Marvellous! The second Ballade is much better known and is an altogether different affair; it is much darker and more mysterious. The opening chromatic runs are nicely judged and suitably sinister. From listening to her playing the “Dante Sonata” I had already deduced that she would be happy with this piece and I was not wrong as she makes a super job of it. The various reflective sections in F# major which are interspersed between the more aggressive music are really superlatively played and provide a great contrast with the more energetic music. Again, she has no problems with any of the difficulties which Liszt throws at the pianist. A particularly interesting effect is achieved at about 4’40’’ where instead of leaping straight into the crescendo, she builds nicely up to it and again, this is what Liszt asks the pianist to do. The Tempestuoso music after the rumbling chromatic music returns is perhaps not as powerful as it could be but this seems to be a conscious decision as she is more than capable of playing in that manner and reserves her full power for later in the work when it is more apt. The closing pages, from the ‘Allegro moderato’ where the serene theme occurs again B major are perfectly judged and all the details are present. I particularly like the reiteration of the main theme, again in B major which is accompanied with scales in the base, this is especially clear with only light use of the pedal so all the details present and correct. She judges the change from this powerful music to the closing quiet pages of the piece excellently. I think I have a new favourite recording of this work! We then return to the Années de Pélerinage for the longest piece from Book 1 – Vallée d’Obermann. This is a largely melancholic piece starting in E minor but progressing through various changes of mood and key. There is plenty of chance in this work for reflective and beautiful playing but also for passionate playing too. The playing around 5’45’’ is gorgeous where the main theme occurs in C major with very delicate accompaniment before tensions increase for the stormy central section full of tremelandos and octave passages. There is one small part where she seems slightly underpowered however everything is crystal clear and I think this is because she is saving herself for the larger crescendo around 9 minutes in, a technique which works very well. After this tempestuous music dissipates, we get a nice reprise of the second theme and some lovely emotional playing in E major. I’m glad she doesn’t follow the ossia music given toward the end of this section as I prefer the original. This leads into a section which could almost be described as a series of variations of increasing complexity and harmonic interest. Again, everything is extremely well played - I particularly like the transformation of the theme with descending octaves runs with the tune in the bass. The ending is odd, Liszt ends the piece on a defiant E minor chord which Miss Berrut adds to with some tremelandos not found in the score. This does not effect the piece and makes the ending more sinister and dark. The final tracks on this disc are the Six Consolations, here recorded in their second and much more commonly heard version. The first of these little pieces is really simple and should be taken up by young piano pupils who would then be able to say that they could play something by Liszt! Again, she plays everything wonderfully and the mood is perfectly captured throughout. The first 2 pieces are meant to be played as a set (if the other 4 are not being played) and the connection between the two is nicely judged as both are in the same key. The second piece is especially evocative and is extremely well played. The most famous of the set is no.3 in D flat which is often recorded and is a wonderfully peaceful little piece. Again, this presents no problems and an atmosphere of hushed reverence hangs over the whole piece, there is some gorgeous playing here. The 4th of the set and is subtitled “Stern Consolation” (Star Consolation) because it was first printed with a star at the top of the page. This is an odd little piece, my least favourite of the set but it is nicely played here and leads me to rethink my thoughts about this little piece. The fifth piece is an Andantino and is perhaps the most varied of the set. Her touch here especially around 1 minute in is extremely well judged and her musicality is obvious. The ending is extremely well judged. My favourite of the whole set is the last one, which is in E major (like nos.1, 2 and 5) and is a cheerful little ditty with elaboration of the main theme from the outset building up to a nice little crescendo in the middle and a tiny cadenza leading to a more impassioned reiteration of the main theme with some nice leaps to contend with. The ending is peaceful, quiet and wonderful – a fitting conclusion to a disc which takes the listener from the depths of Hell to a serene and meditative place with some fantastic playing by a very talented young pianist. The notes are also interesting but lack detail about the music itself. However, they did help me understand the reason for the programming, the thoughts behind it and the subtitle of the disc. Overall, the recording quality is excellent – the sound is very clear with some very clean, precise and highly musical playing throughout. The detail in Miss Berrut’s playing, especially in the more demanding passages (in e.g. the so called Dante Sonata) is amazing. I would really like to hear her record some more Liszt – I wonder what she would make of the whole of the Années de Pélerinage?